The OBD-II data line is a bi-directional communication link which is capable of transmitting and receiving data. This feature allows the Diagnostic Tester to operate system actuators and send commands to the ECM in addition to displaying system data. The high speed OBD-II data stream typically consists of 50 to 75 data words representing virtually all sensor inputs, actuator outputs, several calculated parameters, many fuel feedback related parameters, and cylinder misfire data. The data is transmitted at a rate of 10.4 Kilo baud, giving the Diagnostic Tester a display refresh rate capability of approximately once every 200 milliseconds. Data is accessed from DLC 3, terminal 2. 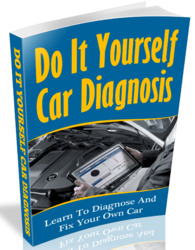 It is triggered by a communication signal generated by the Diagnostic Tester when any OBD-II function has been selected. On OBD-Il vehicles, the scan tool reads DTCs directly from the serial data stream, therefore, codes are displayed almost instantly. Codes can only be retrieved and displayed using the Diagnostic Tester or an equivalent J1978 scan tool. 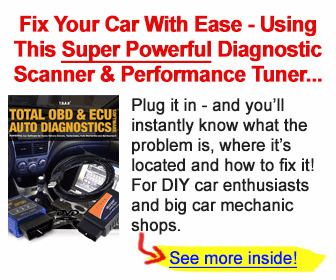 The OBD-II diagnostic circuit is triggered by signals from the diagnostic tester. When an OBD-II function is selected, a Variable Pulse Width (VPW) signal is transmitted to the ECM on the SDL terminal of DLC 3. 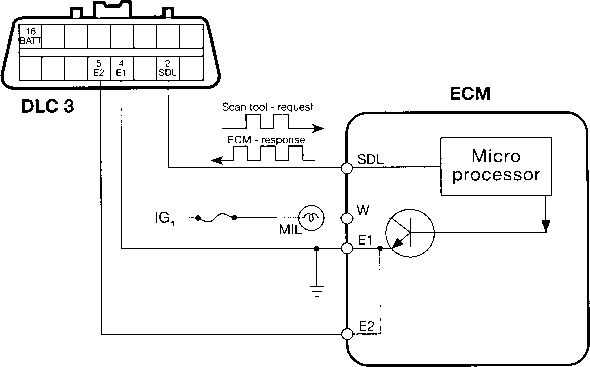 This establishes two way communications between the ECM and the scan tool. Once communication is established, time is shared between the two devices, communication going from scan tool to ECM for a specified amount of time, then communication from ECM to scan tool.